We wanted to end our BOMB The Root series with a star, and so, we chose the late, great, June Jordan. 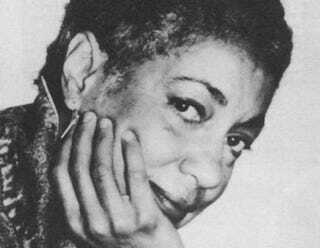 A poet, writer, professor and opera fan—as we will learn—June Jordan was a fantastic and unique voice in African-American literature and social activism. Born to Jamaican parents in Harlem, Jordan spent her adolescent years living in Bedford-Stuyvesant before matriculating to Barnard College. She began her teaching career at City College of New York, and taught at Sarah Lawrence, Yale University and CUNY Stonybrook. In 1989, she moved out west to become a professor at the University of California, Berkeley. In this BOMB Magazine interview from 1995, Jordan discusses how she became the unlikely author of an opera at age 59 and what she learned from her experience collaborating with composer John Adams and famed theater director Peter Sellars. The work, I Was Looking at the Ceiling and Then I Saw the Sky, premiered in Berkeley in 1995 before being staged at Lincoln Center later that year. "I thought that this context would automatically confer a dignity and stature to these young men and women that otherwise might not be available to them." Read the full interview from BOMB Magazine Issue 53, Summer 1995. Josh Kun: Why did you choose to set the opera in Los Angeles? June Jordan: It’s the most heterogeneous city in the United States and demographically probably represents the forecast for the country. That’s why. Folks will work it out in the context of that extreme diversity, or we won’t. JK: Your opera dealt with young people within a context that is fairly uncharacteristic these days, in that it was hopeful. It was not drenched in cynicism or nihilism—or any of the other phrases that get hammered down our throats in both the academic and popular presses. Was that a conscious move? JJ: Absolutely. That’s one of the reasons I was excited to take this on, because I saw it as an opportunity to present Americans under 25 years old through a completely different prism, one which is realistically hopeful. JJ: Well, when people use the word hopeful often the next word behind that is idiotic. JJ: Or utopian, naive, mistaken. This opera is realistic and hopeful. Yeah, both. (pause) My take is based on my actual experience at UC Berkeley, so you can’t argue with me about this. I know that there are all these different components embodied by all of us, and I also know the tremendous positive possibilities of people working together. I’ve spoken with reporters and so on who patronize me, and I think: You can go ahead and patronize all you want, you don’t know what you’re talking about. It’s in my face, my life, my ears—every day. I’ve been teaching here for five years. And my course, Poetry for the People, is, if you will, a laboratory, and the results are in. It works, and it’s people under 25 who are making it work. JK: Let me ask you about the process the three of you went through to put the opera together. Did you write the libretto first? JJ: The composer, John [Adams], said he needed to have the whole libretto before he could begin, so I just sat down last spring and wrote it in six weeks, I mean, that’s all I did. I didn’t do laundry, anything. I put myself into it 100 percent. What I gave to John and Peter [Sellars] is basically what Scribner’s has published now. JK: Did writing with the knowledge that it was going to be sung stretch or change the writing process for you? JJ: Yeah. I wrote everything with the determination to rhyme as much as possible and to have many rhythmical attributes, loading every line and every stanza to facilitate the transliteration of the work into music. John asked me to tape most of it, which I did, so he could hear how I intended it to sound. We had a couple of conversations trying to figure out a common language for his music and my music, so to speak, so that he could move it from words into his vocabulary. I think we partly succeeded. What is very striking about this piece is that the words are clear throughout. Peter has been fastidious about insisting on enunciation, and John took painstaking care in protecting the clarity of the words and verse. JK: That’s a lucky situation. JJ: Yeah! From what I understand, sometimes people don’t speak to each other after all this. JK: How did you come up with the characters? Were you trying to stick within types or were you trying to disrupt the representations of those types? JJ: I wanted to have a cast representative of the people who live in L.A., the people that I teach and work with here at UC Berkeley. I came up with all the characters except for Tiffany, the crime television reporter—she was Peter’s brainstorm. I don’t watch television, so I didn’t know such a thing as crime-as-news existed. I was incredulous when he told me about it. He gave me a list of programs to watch and I was like, “Oh, my God!” And together, Peter and I figured out the Asian-American character, Rick. Actually, I was trying to have everyone in the cast be equal. Original cast recording of I Was Looking at the Ceiling and Then I Saw the Sky.